I use Microsoft Outlook for my email through a Comcast.net address, which is set up as a Microsoft Account so I can sync my desktop and Samsung Android Outlook calendars and contacts. How do I add this account to Outlook now that it's on the new server? After accounts are moved to the new Outlook.com server, anyone syncing calendar and contacts using a Microsoft account created with their own email address instead of an Outlook.com address won't be able to set up their account in Outlook on the desktop as it only supports auto-account setup. 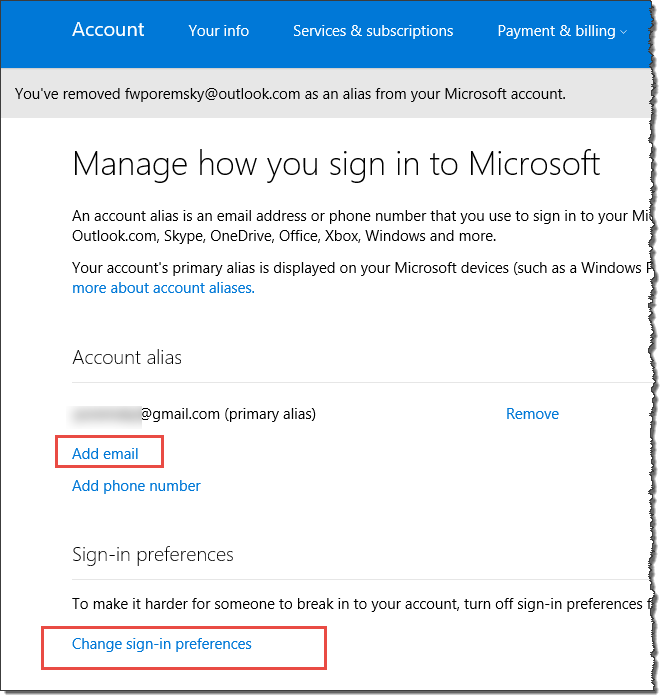 If you try to use auto-account setup, it adds the email account, not the Outlook.com account. To get around this problem, you need to add an Outlook.com alias to your account then set it as a log in account. Create a new Outlook.com email address. If you already have an Outlook.com address listed skip to the next step to verify it can be used to log in. Click Change sign in preferences and verify the new alias is selected so that it can be used to sign in. Use this address to set up the account in Outlook on your desktop and devices. 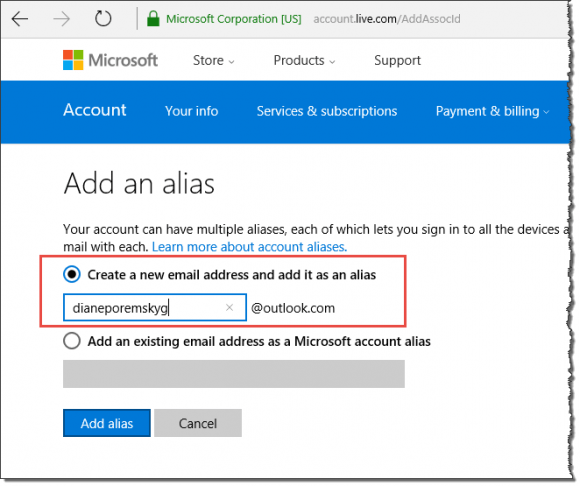 You may be able to set up the account on your devices using Exchange or Outlook.com as the account type and eas.outlook.com as the server name with your non-Microsoft address, but auto account setup will work if you use the Outlook.com address. Thanks SOOOOO much for this! I was nearly in tears trying to figure this out. Now I can get my outlook.com calendar to show up on my desktop Outlook 2016 and on my phone (woot woot!). But is there any way to push info from my desktop calendar and iPhone to outlook.com? You mean to add existing items to the outlook.com calendar so they sync? You'd need to move the events in the local calendar to the outlook.com calendar folder in outlook - on the phone, you'd need to change which calendar each event is on. Will my @msn.com email account work or do I need to get a @outlook.com account too? That is a Microsoft-owned address and counts as an outlook.com address - if you had a gmail account (Comcast, yahoo, etc), you'd need an alias. Thank you very much Diane, I have been dealing with this issue for a few days now. Vey detailed and accurate information. Thanks and God bless you! Diane.....thank you so very much for this information. I have an old Outlook.com log in that is NOT outlook.com. I lost all my syncing between Outlook 2016 and Outlook.com (which syncs to my phone). Microsoft has great information on how to re-sync.....as long as it's an outlook.com e-mail address. I tried Auto sync and manual sync, and as you stated, all that synced was mail...no contacts or calendar. You explanation and fix for this problem worked like a charm. I wish Microsoft used this information. Again...Thank you!! Thank you for your Manual! Is ist possible to send emails from outlook with your non-microsoft email-adress having outlook configured as Exchange Connection, not as EAS connection? You can, if you type the address in the from field - but you need the address set up as a connected account and its sent on behalf of the outlook.com account. If you want to get rid of "send on behalf of" problem it looks the only solution is to set an additional IMAP account. If it is a non-microsoft address, you need to add the account to Outlook as pop or imap so you have the smtp server to use.